Large breed dogs are, well, big! And when it comes to nutrition, they have bigger and different needs compared to smaller breeds. Make sure your big dog is getting precisely balanced nutrition designed with size in mind – Hill’s Science Diet Large Breed Chicken & Barley Recipe natural pet food, plus vitamins, minerals and amino acids. This premium large breed dry food for dogs is formulated with real chicken as the #1 ingredient, and it contains no artificial colors, flavors or preservatives. 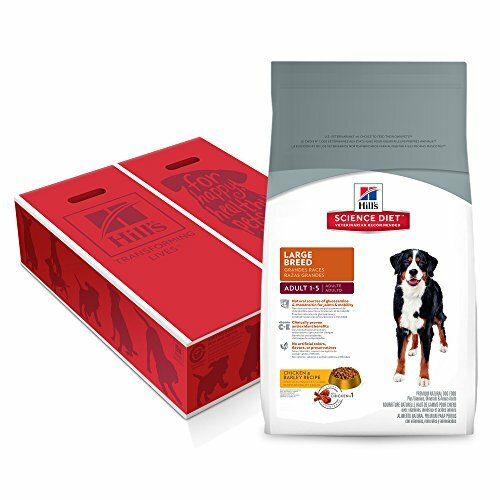 Hill’s Science Diet Large Breed dry dog food provides natural sources of glucosamine and chondroitin, the building blocks for healthy joints and cartilage, and it’s made with a clinically proven antioxidant blend with vitamins C and E to help support a healthy immune system. Give your big dog a healthier, happier life with Science Diet Dog Food for large and giant dog breeds. Recommended for large dogs weighing 55 - 110 lbs (age 1+) and giant dogs weighing 110+ lbs (age 1+). *Hill’s 100% Satisfaction Guarantee: We're confident your pet will enjoy Hill's Science Diet foods. We're so confident that we offer a 100% money-back guarantee. If you are unsatisfied for any reason, return the unused portion to Amazon for a full refund or replacement. For more information on returning an Amazon purchased product, visit the Amazon returns center.